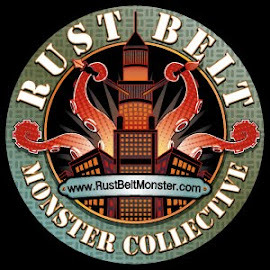 The Rust Belt Monster Collective is six professional illustrators from Cleveland, Ohio. This is their blog, a way to get your first look at the steady flow of art from the baddest art group this side of the Cuyahoga. On the web, the RBMC is known for their art challenges, a bi weekly illustrative gauntlet where each member is tasked with creating their version of various pop culture prompts. Along the way, the blog is also a place for each member to offer peeks into sketchbooks, hard drives, or even cocktail napkins they've doodled on. In real life, the Monsters are known for creating live art murals, working with children, and hosting the Cleveland chapter of the Drink And Draw Social Club. You can find out more at their website: www.rustbeltmonster.com , where all the arts cataloged, the live murals are documented, and you can even buy a thing or two. Tim, W9: Ralph McQuarrie Tribute Concept Vader! Tim W7: The grass is always greener! Hey, look at Tim's Vampirella doodle! WEEK 17: Sabretooth- Oh..there will be blood. Blame to much T.V. and " AMC Fearfest " for this one. First time drawing him, and I gotta say, it was pretty fun.